Now with Audio and Video streaming! The EDGE Simulcast powered by Velocicast team is excited to announce an all new android app! 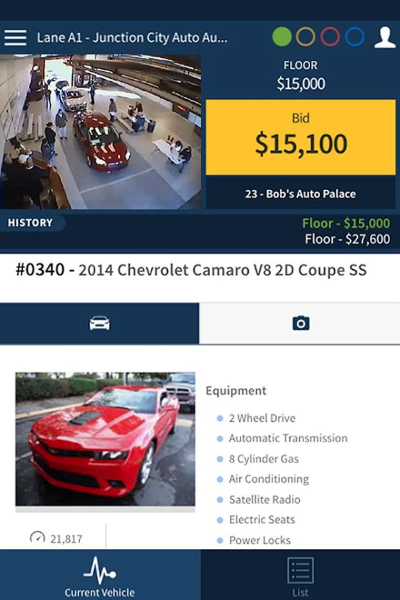 Buying online (and on the go) at independent auctions has never been easier. Bringing Audio and Video streaming into the app is just one example of the many enhancements this new version brings. This is an entirely new app in the app store. That means that users who have the old version will not be prompted to update. It is recommended that they uninstall the old version, and find the new one on Google Play Store (or follow this link). Hello Friends! The EDGE Simulcast powered by Velocicast team has an exciting new release, available now. The team has enabled a new way for your Clerks to add / edit announcements on a vehicle. As you can see in the screenshot above, this approach offers an "auto complete" suggestion once the user types at least two characters. The suggestions are pulled from the list of "canned" announcements in your AMS. The aim here is to allow for a faster workflow and more consistent formatting of your announcement messages. This approach is optional, and is turned OFF by default. 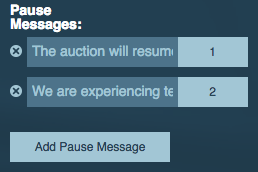 If you'd like for it to be enabled for your auction, please create a ticket at https://support.auctionedge.com/ or send an email to simulcast.support@auctionedge.com. The team is happy announce another round of features & changes, which are deployed live now. New "lights only" screen - A new floor screen that mimics the functionality of the old toggle switch light boards you still see at many auctions. This screen is 100 percent configurable. You can choose the lights to show (up to 4) and the text description for each light. The appropriate lights will light up or turn off depending on the lights assigned to a vehicle. 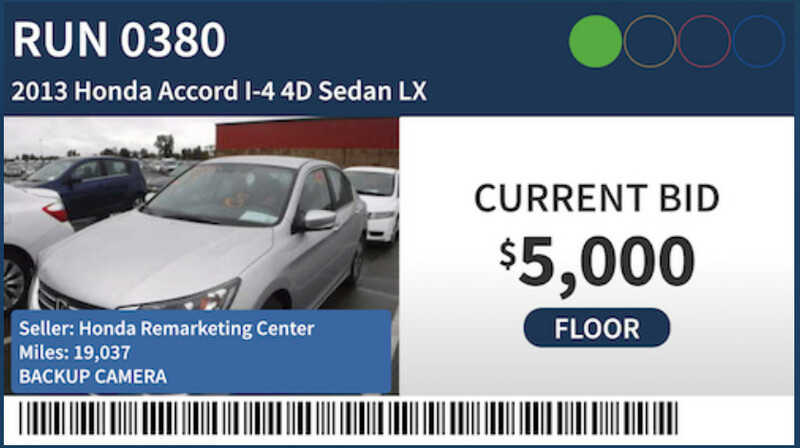 New floor screen "image, seller, miles, trans, announcement below"
The EDGE Simulcast powered by Velocicast team has released a new set of features / enhancements that are LIVE today! If you type 'YES' and click 'Disconnect' the other clerk with get a notification that they have been disconnected. Replaced the term 'If Purchased' with 'Offer'. This was confusing some dealers, and the new language should make it more clear. Fixed a bug with required lights - If a user set a light as required when that light was not an available light, then the clerk would get stuck in a place where a light is required that can't be added. Now, the light will only be evaluated as required if it is one of the available lights. Require a confirm or undo for an online sale before moving to another vehicle - Some clerks were not clicking confirm before moving to the next vehicle so now we prevent them from moving until they either confirm or undo the bid. Hello auction friends! The EDGE Simulcast powered by Velocicast team has another big feature release that is LIVE now! 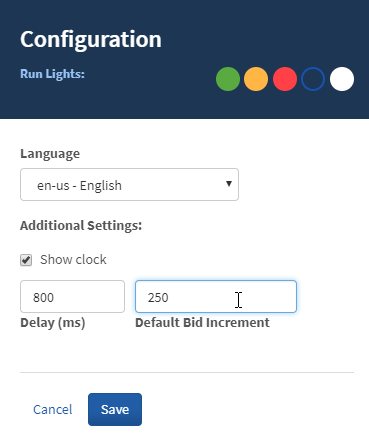 Delete Prebids on block - clerk can easily delete Prebids on the block. Bidders will get a notification that their prebid has been invalidated and the prebid will no longer play out. 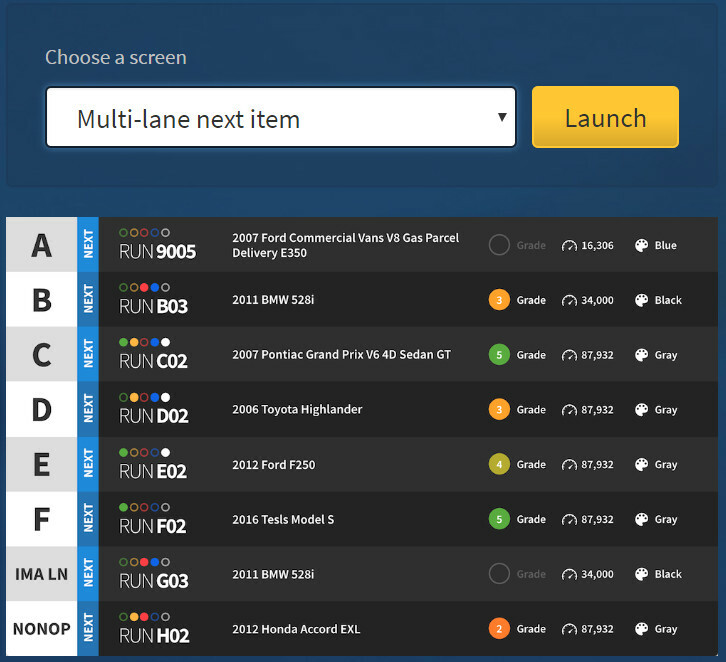 Confirm Online Sale - A new setting 'SingleClerkOnlineSaleConfirm' when set to 1 will require the clerk click a confirm button when a vehicle is sold online instead of automatically sending a single clerk message. This will prevent accidentally selling vehicles to online bidders that slip a bid in after the vehicle is sold. Odometer status on clerk - The clerk can now see Exempt/Discrepancy/Actual Status of the odometer. Demo data reset - Admins can now reset demo lane data from the admin website. The EDGE Simulcast powered by Velocicast team has another round of new features, this time focused on improvements for auction clerks and auctioneers. These changes are in effect now. Announcement Picker - The announcement picker now grabs the first 18 items from the announcement list stored in your ASI system. For other Auction Management Systems, the Velocicast admin site allows auctions to define their own custom list of pre-canned announcements. Notice that editing Miles and Title Attached are now done in this view. Internet Explorer - Microsoft now only officially supports Internet Explorer 11. All previous versions are end of life. In this release, we've added a warning message to any user attempting to use the Velocicast clerk with IE 10 or older. Of course, Microsoft Edge, Google Chrome, and Mozilla Firefox will work as expected. Floor Codes - the Auctioneer Pro Screen will now show the floor code for the vehicle, it it is provided by the auction system. Onsite Bidder lists - for the current vehicle being sold, the auctioneer will now be able to see the bidder badges for all reps who are at the auction that day. 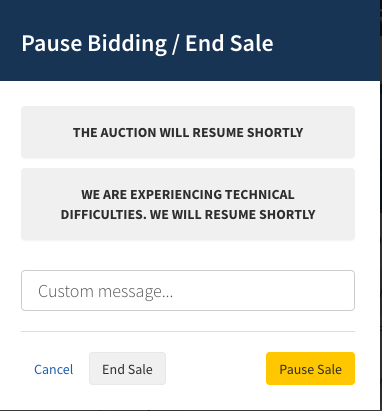 BidNoShowDealer setting - This is a new setting that allows auctions to prevent the Dealer Name from showing on the bidder screens when an online bid is accepted. This is a setting that has to be set on the customer maintenance screen by system admins. Hello from the EDGE Simulcast powered by Velocicast team! We've been working hard on many new features, and we're excited to share with you today a long list of enhancements which are available immediately. New Floor Screen option- "All Images plus announcements"
Hello auction friends! We're back from the holidays and excited to share some new features! The EDGE Simulcast powered by Velocicast team has been hard at work, read on to see what's new. There is now a new button for online attendees that opens a Reports Panel. There are currently 3 reports available.